British Singer from the band One Direction. He has claimed to stand both 5ft 11 and 6 foot. Hair and body frame I think helps him look 5ft 10-11 at times in photos. Rob, please can you calculate the heights of the Blackpink girls (maybe Lisa and Jennie) and Jungkook and Jimin from BTS? There's no way this dude is 6 ft. He's looks more like 5 ft 10 in the morning, possibly, and at worst 5 ft 9 but there is no WAY he can get with 6 ft. Probably, but I haven't looked at harry for a while now to remember who! Seriously guys?! Harry isn't 5'10", he's more like 5'9.75" at best and 5'9" at the very worst. The only way Harry can be around 5'10" and up would be him wearing lifts, elevator shoes, or boots. I’m not sure his exact height, but I have proof that he’s not much taller than the other one direction boys than everyone thinks (by the way these are when he was 19, and I doubt he had a growth spurt as an adult; also note he has no shoes on). This guy is probably 178 tbh, he doesn’t have the best posture and he definitely isn’t above five eleven so 178-179. And tbh in an honest world that’s not a bad height, it is above average. Also why everyone hating on him wearing heeled boots, like many other actors wear them so just chill and leave the guy alone. He's got the proportions for being 5'10, I think. Definitely pulls it off more than, what's his name, Austin something. He is without a doubt at least 7cm shorter than his listing on google. I've actually stood right next to Harry Styles recently and would say this is about right but like others have said I wouldn't rule out 5ft9.75. He isn't under 5ft9.5 and he had normal 1 inch style shoes on. 5ft9 and 5/8ths even could be bang on. I'm 6ft0.75 and felt roughly 3 inches taller give or take. Rob how tall does he look here ? Tricky to say, but overall I think even if Leto was 176, Harry would still edge him. Harry's claim of 6'0" is absolutely ridiculous. He would I'm 6'1" if we met which I'm nowhere near, since I'm around 5'10" to 5'10.25" during the majority of the day. That's ridiculous. You have zero proof that he has that condition. People have varied opinions about a celeb's height all the time here. Harry has a limb length discrepancy, which is an orthopedic diagnosis that means one of his legs is longer than the other. I’m guessing that’s why there are such varied opinions regarding his height, because whichever leg he’s utilizing the most to stabilize himself will determine his height at that particular moment. Hi Rob, where i can find the interview where Harry said that he’s 5ft 11 with hair and heels? I don't know where, there's a lot of comments over the last few years about Harry and I'm sure there is a link somewhere to an interview which he claimed 6ft too. Phil, trust in me, i’m 5ft 9 ( at night ) and i wear everyday The same shoes of Harry ( Saint Laurent ) with skinny jeans, but is still hard appear tall like him. I went to his concert and he’s tall. More than me. 2 cm of difference i don’t know if could change something. This guy claiming 6ft is hilarious. He's the male version of Taylor Swift when it comes to height. People seem to think they're both really tall when in reality Styles is average height and Swift is moderately tall for a woman, but certainly not what I'd class as "very tall". Styles can look taller but that's purely due to a mixture of being slim, wearing heeled shoes and spending lots of time standing next to really short men like Tomlinson and Malik from 1D. He is 5"9. He was the exact same height as me when I stood next to him recently. What is wrong with these people guessing 5'11"+? That's just absurd. Sorry rob but he is legit 6ft Click Here in here he looks taller than your guess. He's in the 5'8-5'9 range. Here he is in Malibu wearing no massive heels, shoe size still might be the bigger size he always puts on, who knows - but he looks very 5'8-5'9. He also looked like he was in the 5'8-5'9 range when he shot for Gucci and wasn't in the heeled shoes. Pretty obvious it's just an illusion since a leaner figure, and heeled boots always makes him look taller. All of One Direction were using tricks to make themselves look taller, and then they stopped after they left the band and it turned out they were always 5'7-5'8. Same with Harry... Tricks. Rob, in your mind, does Harry wears insoles or heel lift? I think he sometimes likes a larger heel, but I am not convinced he is out there in lifts. Harry looks taller than Fionn on every press photos and red carpet photos as well,but now new photos came in(same footwear). Fionn is like 174...so Harry wear's lifts or not? He's not 5'10 or anywhere near it imo, 5'9.5 is the most he can look considering his footwear choice. Rob, during the 1D there was a wresting match (Liam vs Kurt Angle) where Liam looks like taller than Kurt. So? Is Harry Styles 178 cm? There is a photo with Harry and Kurt too. There's a good chunk of people who estimate harry at 5ft 10 range...I mean, that's not exactly out of the question, sometimes he can look as tall as that. @Loman Not sure what you were trying to prove with that last photo? He's standing in a crowd of mostly women who are all probably on a range of 5'1/5'2-5'6/5'7, including that older guy towards the left. Those 4 youngish guys are all probably about 5'8-5'9. Harry looks easily around 5'9.5 in that photo. And keep in mind, it's ONLY 5'9.5. That's not far from 5'10 at all. He's barely getting edged out by any true 5'10 guy without looking closely, so anyone screaming 5'10 as if he's listed here as 5'8 or something really need to calm down. And a lot of you seem to casually ignore that it's been proven he often hikes himself up A LOT with heeled boots that are too big for his feet. He's simply no where near 6'0, kids. I went to one of his concerts and he was walking near me reaching for hands, ground was even. Couldn't see what boots he was wearing but he seemed a lot taller than what I expected. I'm 5'9" barefoot, was wearing Doc Martens which bring me up to 5'10" and a bit, and he was still a lot taller. He seemed 0.5-1 inch taller than me in his trainers. Starting to think Harry's a solid 5'10" or dare even 5'10.25. It would be surprising if he was that tall, 5ft 10 is about the most I'd guess him at. Mmm...Rob If Jimmy Fallon in 180...Who Harry Styles looks like taller him. Wheels can’t change. 176.5 + 4/5 = 181 cm, so Jimmy with any pair of shoes should still be taller. So Is Harry height wrong or Jimmy Fallon’s? He's shorter than Fallon when wearing same shoes, at least he did in that civil war sketch I thought, but you could still argue harry can look almost 5ft 10 at times, 6ft with hair. Needs a big upgrade. Same height recently as 5ft 11 1/2 Zach Braff. Funny how another site described him as 176cm and 74Kg,so far the only one who gave a lower listing than Rob.I wonder if its editor is angry against Harry. I am 5'11. And guess what, I saw Harry he was at least 2 inches shorter than me with his boots. Obviously I'm assuming they have similar shoes which is very likely. As you said he was already 18-19 years old with Taylor and picture of dodgeball with Corden isn't young, he was 21, the event is almost 3 years ago, he is not late bloomer.. I'd definitely say harry is a good 6'-6'1, no less than 5'11. I used to think more like 6'2 but I believe he appears this tall due to his heeled boots (which I love I'm not complaining). In a picture taken with Ansel Elgort, who said himself he is 6'4, Harry does not look small enough compared to him to be 5'9, even with the supposed 'lifts' in. He can easily pass as 6' here. Also, Harry has previously dated Kendall Jenner, who confirmed in a recent interview with Ellen that she is 5'11. He appears in pictures to be about an inch taller than her, so I'd say confidently that he is 6 foot. There is no way that he is 5'9! May be when he was only 16 on the Factor, but it's been 8 years and people grow!! On this site you have Taylor Swift listed as 5'9.25, and still claim that Harry is only 5'9.5. Clearly this is wrong because she is a tall woman and I believe that her height is probably accurate on here, and in pictures with Harry he is clearly 2 inches taller than her at least, making him around 5'11 back in 2012/13, which really isn't that tall so it's easy to believe. That gives him 5 years to grow supposedly 1-2 more inches, which seems perfectly normal. Also, some younger pictures of him with James Corden show him to be only around an inch taller; however more recent pictures highlight their now larger height gap. Even seeing Harry in concert you can tell that he's quite a lanky, tall man - he doesn't appear short at all. He looked clearly the tallest in 1Ds last tour, and looked tall compared to his guitarist Mitch when I saw him recently. Even when they all wear the same shoes.I really believe he is as tall as he says he is. Probably shorter if its true. He’s wearing his Saint Laurent heels and she is wearing sandals and he still looks shorter than her. plus he's taking a longer stride than your friend, I'd put harry at 5'9.75"-5'10'' barefoot if they were standing side by side. Loman, in the video with Jonathan Ross, right at the beginning you can see a 5cm (2in) difference between the two. Then Jonathan bends on one of his legs and looks shorter than he actually is. Since we can't see their footwears, we can't say a lot from that video. As for the pic, first of all they are almost all females. Than you can see the super strange type of shoe of Harry. He is even bending on his external part of the feet to push taller. He fails to reach Nick Grimshaw, who's listed at 5ft10.5. 5ft9.5 in my opinion makes sense. Even with 1" more shoe, Harry CANNOT be anything below a STRONG 5'10". Would a 5'9" guy look like this in a crowd? Also Puth doesn't need an upgrade, neither does Levine. Styles is debatable, I think Chris Brown and Justin Bieber could be taller. Not sure about Shawn or MJ, both look their listing exactly. How the f is this guy listed as 6ft. 2013 - Harry just turned 19. I for one find it hard to believe it actually grew after the age of 18. 2:37. Really looking 5'9.5" against 5'8" Niall. Rest of video has some good comparison shots too. Harry's posture is/was awful. I think he straightened up, slimmed down a bit more, started wearing chunky shoes, and that's helped give the illusion that he's a strong 5'10"/weak 5'11". And boy, he does look it at times. I'm going to go with 5'9.75". No doubt he clears 5'10" out of bed, though. solid 5ft 9, nothing more with those 1-1.5 inch heels. I just went to the concert in Amsterdam and got a chance to hi-five with him in the middle of the show when he is walking down. I'm 176cm and we have the same height when I stand beside him. I think with a ton of listings you could make a case for being a fraction above or below quite easily. If I think I've seen enough to go with another mark, I will give the celeb that new mark. Harry styles is 5'11 without shoes! Lmao... "Harry is 5'9+! He is 5'10+, no he's 5'11! No... He's 6 ft!" @Warren there's a bunch more of him out that day, he's 5'9. Lol, anyone who BELIEVES he is anything ABOVE 5'9 are dreaming and painting a picture of an alternate reality, they're dying to see. Here is a 5'9 Harry (recent photo) taking a stroll in not silly clown shoes that are overly large that PROPERLY fit him. Notice he's tiny now? Told y'all but ya didn't wanna listen. Yes Luke himself claim 6'0" even, he actually has Harrys claim 6'0"
Luke Hemmings no shorter than 6'2? Now I actually want to see how you'd justify something like that because he only claims 6'0 and was measured with shoes on and with his fluffed-up hair at 6'2. It seems pretty implausible that if you gave him a buzzcut and took his shoes off he would hit that mark. You have Luke Hemmings listed as 5'11 3/4 and here's Harry, hunched over, standing next to Luke Hemmings being almost the same height Click Here (Luke is two years and six months younger than Harry, at the time of the picture, late 2013, they were both within growing age, 17/19). You really think there's a two-inch difference between these two guys: Click Here and don't even try it, Luke and Harry wear basically the exact same footwear and always have. Luke has been accused of stealing Harry's sense of style countless times (by the way, there's no way Luke Hemmings is currently shorter than 6'2'', but I'll pick my battles). You keep using that James Corden argument, when the picture you use to compare is not accurate because 1. James has his head tilted back, which makes him look taller. 2. James is standing several inches ahead of Harry. That's a trick Louis Tomlinson pulls all the time to look taller. Nobody here is claiming Harry is this outlandishly tall guy. He's 5'11''. Just SLIGHTLY above average for the UK (an inch). I can't help wondering what makes the moderator lower the height of literally every single male celebrity here (and female celebrities too, when it's convenient to prove that a male celebrity is shorter). Strong 5'11, on the movie dunkirk he looked very tall. He can look 5ft 10 range for sure there. i think harry could possibly be 5’10 although he hunches over and one of his legs is shorter than the other. i think i saw some article about him going to yoga to fix his posture, so i think the photo above is not telling bc he was young and still growing and still had bad posture. maybe he’s gotten a half inch taller, maybe he hasn’t. The real question is, how tall is Editor Rob and why is he trying to make it seem like tall guys are shorter than they actually are? Harry generally looks 5ft 9.5 at least, I can see how people estimate him 5ft 10-11 range, sometimes with hair+heels he might look that tall. If I see enough to think a listing should be taller/shorter I'll change it. Sometimes it takes time and a lot of litsings in my list of 'should I change this' are like a 50/50...maybe I'm not so sure, so leave it as is for the time-being. There's so many celebs listed, with many more to add, it is a ton of trivia I absorb running this site. That’s in your imagination, right? Harry’s a full to strong 5’9”. @trp Several issues with your comment. 1. McGregor isn't a professional boxer. He's a martial artist and UFC wrestler. Yes, he did boxing as a child, but in his adulthood, he has a total amount of 1 professional fights, the one with Mayweather. And he's listed as 5'9''. So I'm not sure what your point is here. 2. Actual professional boxers CANNOT lie about their height. Height is a big issue when preparing for a professional boxing fight and not listing the correct one would be a huge disadvantage to the rival. So no, you can't inflate your height in official stats. Sorry. And the example you used is flawed. By the way, I'm a professional sports journalist who used to work at Fox Sports. I know my boxing rules. But let's say Fenech did shrink by three quarters of an inch because he's older now. The difference between him and Harry isn't just three inches, unless Harry's scalp, eyes and half of the bridge of his nose can fit in half an inch (hint: they don't), and that's even giving Harry the average forehead size of 2.5 inches, which we know it's not. He's AT LEAST three and a half inches taller than Fenech. If not more. By the LOWEST possible calculations, making it so that Fenech has somehow shrunk 0.72 inches and Harry being only 3.5 inches taller than him (wild low estimation), Harry is AT LEAST 5'10 1/2''. I maintain that he's 5'11'' maybe even taller. And so do my friends who met him in gym gear in Los Angeles last year. I'm not sure why this website is so hellbent into making male celebrities so much shorter than they really are, but it's kinda weird. PS: I added it to my original comment the other day but I think it didn't go through. I was goofing around with some friends on Harry's IMDb and we changed a lot of things there (trivia, nicknames, his bio, etc). And we thought it'd be funny to give him a weird height, so we gave him 6'0'' and I think it was 1/4? We didn't expect them to change it because we had nothing to back it up, but a week later, lo and behold, they had. And now he's listed as 183 cm, which we all know he's not. He had nothing to do with it. I have the actual proof of doing that change lol, I'm not blindly defending him. When you contribute to someone's article on IMDb you get a contributor's page. Anyway, that's where Google pulls it from. And no, I don't think he's that tall. I think he's 180, 181 tops. Boxers heights have been very untrustworthy even if it's from official stats, Conor McGregor was once billed as 5'11" on a fight and recently with Floyd Mayweather he looked about 1 inch taller than him, making McGregor 5'8.5"-5'9". Also keep in mind Fenech's 172cm listing may have been from when he was younger, he looks around his 50's now so he was bound to shrink a little. I wouldn't rule out Fenech as a solid 5'7", boxers tend to bloat their heights. But I do agree that Harry does seem a bit taller than this listing, I'd give him 5'10" max. According to Fenech's data, he's 172 cm, which is 5'7.72'' inches. Fenech's data was curated by doctors and professionals, as that's standard procedure for professional boxing, so there's no skimping there. Harry is not less than three inches taller than him. I would actually guess four or more. The average forehead is 2.5 inches, and Harry's is larger than average, but let's say it's that. Fenech's hat is pulled a little up. I'd say he reaches about the middle of the bridge of Harry's nose without the hat. 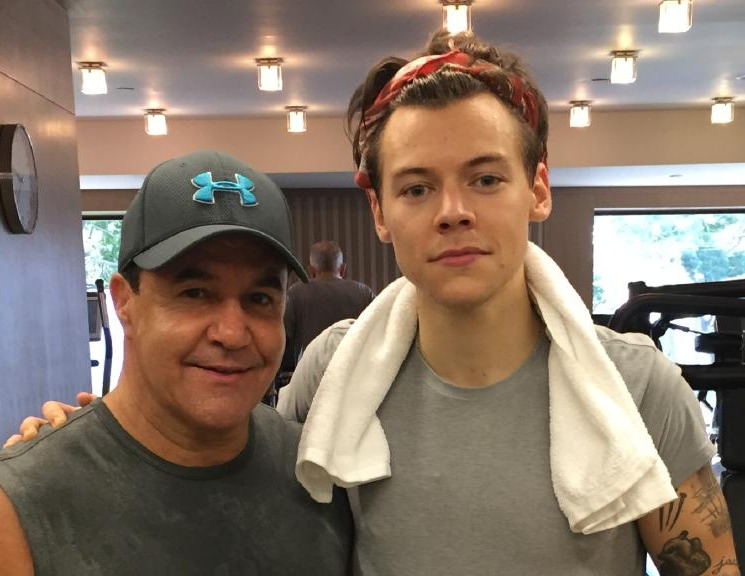 Harry's hair is flattened by a headband and they're both wearing gym gear (Harry has never worn gym shoes that add height, you can check for yourselves, also, they boxed, and you usually box with normal gym shoes). So 2.5 inches of forehead + top of head + eyes + half the bridge of his nose it HAS to be at least 3.5/4 inches. 5'7.722'' + 3.5 = 5'11.22. I think he's 5 ft 11 1/2 inches. Between 180 and 182 cm. That's 5 cm taller than you have him here... And this is as factual as it gets. I'd be surprised if he really has 5'10" 5'11"
I don't think he is below 5'9.75 Rob. Actually there's a chance he could be 5'10 but 5'9.5 is really a bit unfair for him don't you think? I can understand almost 5ft 10 estimates, he can look it at times...but I think he usually has a thicker heel to achieve a near 5ft 10 look. yeah this guy somehow bamboozled google and imdb into thinking hes a real 6 footer, i guess though he has fans who will try to back it up. also do you know when he claimed 6 foot. Rob,he is listed at 6ft (183 cm) on google. That's quite an exaggeration(6cm above his actual height). Btw,is there a chance he's 5ft 10? He can pull off looking 5ft 10 at times, though he likes to wear a thicker heel sometimes. Rob, when you hover your mouse over the right side of the image there's an arrow that pops up to look through the other ones. The heel is certainly 1.3-1.4, and I wouldn't rule out the chance of a little lift, though of course it's hard to tell. Why does his shoes look weird in this pic? Scroll to the 5th pic. There was only one image there, but it is a bit weird looking. Hard to tell just how thick his heels are there. Rob if you’re doing 1/8 measurements now do you think 5’9 3/8ths would be a little better fit for him? I think I'm happy with giving Harry a full 5ft 9.5, I really think he looks that range most of the time...sometimes even a bit taller. 5’9-5’9.25”. Like honest Sloven said. Unnecessary upgrade. Could even say he is 5’9.75”. Not that he is 5’10” whatsoever. But he can pull off a weak 5’10” quite well. His 6 foot claim is ridiculously embarrassing. No more than 5'9". Eh? seeing at the Justin's there, which is the actual of your height 167 or 176? or just a same name and wrong person? His slim body gives a 5'10+ look. He's probably 5'8.75-5'9.25. Rob, I measure 5.9.5'' (176 cm) in the very late night after a long day, and measure about 5'10'' (178 cm) without shoes in the morning, which part of my face would you think he would be looking at if we were to stand up barefoot? Harry next to Morgan Freeman. Clearly a fan. I have no idea whats the height difference between Louis and Harry is. It's all over the place. I'm not really into fashion but i know those are not loafers. I desperately want to see photos of Harry Styles and Brad Pitt standing together for a long loooooong time with lots of angles. He can still pull off looking 5'10 even when he wears converse sneakers. I really don't get why most of you think he could be as low as 5'9.5. Can a 5'9.5 person really look that tall considering no lifts worn? I think he actually is 5'9.75-5'10. Jackson that's probably the trickiest pic ever. You don't know how photos and perspective can fool you. Have you ever seen that kind of pic where there's a girl that's touching the Eifel tower? That girl must be reaaaally tall, cause in the pic she seems taller than the Tower!!! No way perspective takes action there, she's probably 200meters tall! Warren, sure, you are right. We are seeing things. Problem is, he doesn't like to wear flat soled sneakers when it actually matters: when we can compare him to other famous people who's height we know. Of course he doesn't sleep in his heels. Plenty of photos of him wandering around barefoot, even old ones with his band-mates. Hope you guys know how to zoom in. I'm just kidding Harry's fans. Editor Rob: without reference, it's harder to say much. He drops to 175 by dinner time, 176 is more of a lunchtime height. If Jake Paul and Harry were to stand together who would be taller? Editor Rob: barefoot Jake I feel is the taller of these 2 men. Nah I am sure he wears lifts all the time.That's why google listed him 6 foot.Men wear heels too! He's listed at a ludicrously optimistic 183cm on Google. How does one correct such a ridiculous mistake? I'm a measured 180cm and have seen him close up to know he is noticeably smaller than me. Robin you didn't take into account that he was wearing huge heels. He went from regular shoes with a bit of a small heel to full on heels. His footwear is obviously what makes him bigger in that photo with Khalid. I guarantee he is wearing huge heels as well because he tends to in suits like that. Keep in mind Harry also wears shoes that aren't his actual size, which gives him a height boost. The shoes he is wearing are more likely too big for his own feet. Khalid isn't even standing straight in that photo either. He's 5'9, at most in the middle of 5'9 he is no where near taller. There have been multiple instances with Harry's band mates the The has the same body as them and is the same height as All of them, when he is wearing proper footwear. If Harry was truly over 5'9 he would be towering his old band mates but never did unless wearing huge shoes and lifts etc. Here is a picture of Harry with Khalid: Click Here Khalid is listed as 5'8, so Harry is taller than what's listed here. He's also taller than Corden and Swift. Harry might be 5'9" in 2010 and in the picture above, but it has been [] years now and he has grown. Guess we can always count on Batman as the voice of reason. Do you know how ridiculous you sound right now? Of course Harry isn't 6'2", he never even claimed to be that tall himself. So now you're gonna say that he's downplaying his height? Guys look how tall Harry Styles is, look at his huge shoulders. Must be like 6ft2in tall. It's not the fact that's he is wearing huge heels all the time, or the low stance of the button on his suit jacket, or how thick and wide his oversized shoulder pads are, or the fact that all the hosts are short, or the fact that the show was held in Asia. No. He is just 6ft2in tall. Accept it. Now please, give us a Victoria's Secret show in Norway/Sweden/Germany/Holland/Denmark with non short hosts from those countries. And Harry Performing barefoot with no suit jacket. Also, most importantly, make the models stand straight and not bend their knees in a weird way. Unnecessary upgrade btw, his 5’9.25” listing was better. Also surrounded by many 5’7-5’8+ models wearing 4 inch heels, he is the same height as the models. He was wearing heeled shoes that night. Oh silly google listed him as 1.83 m now, at his age I highly doubt he's even grown half a cm. What's going on here? James D'Arcy is listed as 6'3 on this site. Google lists him as 6’0”. Preposterous. I think he is 5'11" or 6 feet. I feel like he’s a little taller than 5’9.5. He does have bad posture and he slouches a lot so if he stood up straight while getting measured then maybe he’s 5’10. I do have to admit that he's really just barely 5'9"/175 for ur attention! and him with Louis photo's r many photoshopped there! Rob,can you consider an upgrade to 5ft 9.75 for Harry? He looks 'almost 5'10' most of the time. @ Warren -- He could possibly be 5'9 25" but, none of us will ever know, until he is next to someone who is 5'9 while he's bare foot, or when there is a time he isn't wearing lifts/monstrous shoes, then we'll know. But for now, he's clearly 5'8-5'9.25 in that range. I'm gonna have to go with under 5'9 because there has been so many instances where he is with his bandmates and he's wearing lifts, and all, but he isn't taller than them, or is still taller then him. There has only been a few occasions where he is super taller than his bandmates, but those were when he was wearing lifts/thick heel/a size that doesn't fit him ;) -- Louis was literally almost the same height as Harry during Billboard 2015. A 5'10+ Harry, or even 5'9 would be towering him. Especially with lifts/clown size shoes, yet.. Doesn't. Hes gonna get downgraded . Hey there! You see in this picture Click Here with Charlie Puth he seems a little bit taller than him even tho Charlie is listed on here as 177 cm compared to 176.5 from Harry... I don’t get it man. Lmao, that’s nothing new, it was there while I was trolling dreampuff and yourself, maybe 2 or 3 months ago. Warren - I recommend taking a look at the video of Taylor Swift dancing/singing around on stage with 5'7 Joe Jonas. She was in regular cowboy boots, and Joe wasn't wearing lifts or a shoe with even a heel, and Joe was literally the same height as Taylor. Taylor may of been a strong inch taller though. Now here is her besides Blake: Click Here -- Despite having huge heels, she's the same as Blake? Slightly taller, but not that tall, and that's with a thick heel. Despite being taller than Zac, she's never far from him, UNLESS she is wearing heels. Zac is 5'8 100% but either week, or almost mid 5'8. be taller. If she was 5'10 she would be way taller than that, next to Zac. But... Isn't. The only reason Taylor is taller then him, because look at her heels: Click Here -- If she was truly 5'10.. She'd be towering over Zac especially with those heels, but she is barely taller then him. Harry was more so honest in 2013..
his size. If he was 5'10-5'11 he'd be towering over all of them. But, no he's just in the 5'8/5'9 range. he is for sure in the 5'8-5'9 range. Click Here ... More so, 5'8. And the proof of that is because of his bandmates. Occasionally you can stumble upon Click Here bulging sneakers. And wonder whats Click Here going on with his right boot. I really, really doubt that he is lower then 5ft9in. Anywhere between 5ft9in and 5ft9.75in is possible. I think he is 5ft9.25in in the afternoon. Harry does wear heels, but to his credit, he doesn't hide it at all. I really doubt that he can stuff a 1in lift in his average boots he wears. he is 5ft11 at morning withs shoes on. Warren there is no possible way to tell. He buys overly large shoe sizes that don't even fit his feet, even his band mates confirmed that, and he wears lifts in them. Yet, while bare foot, he shrinks majorly. The only way to know his actual shoe size is if he told someone, but, if he lies about his height, there is no way he'll spill his shoe size. He's insecure about his height, so he sticks to overly large things/lifts .. All the time, so people don't ever second guess it (and even thick heels on his shoes.) He wears pants that don't fit him either (there is so many photos of proof.) Because he wants to give off an illusion he's bigger. Meh. No wear neeeear 5'10. So how would u guess his actual shoe size in the us? I do wear us8 at my height 5'8" strong btw could he wear my shoe size if he's only my height? Warren the point of those photos were to mostly focus on his shoes, he is wearing monstrous clown shoes that do not even fit his feet, and you can tell the difference easily. When bare foot he's all his bandmates regular height. He is no wear near 5'10. And for sure is in the 5'8-5'9 range, even from the bare foot photos it's easy to tell. and thank u @Geeus but do not have to do posting so different angles photo like 5's and 7's, that's hard to judge. Liam is easily the tallest out of the band like I said before. Styles is no where near 5 ft 10, I don't even think he's around 5 ft 9.48 considering he wears such large shoes that aren't even his correct size, and because he obviously wares lifts with the boots heel. From the Cindy Crawford photo, we see that Liam and Crawford and Harry are all the same height (keep in mind, Harry is still wearing a boot with heels, that is most likely not even his size. Now, watch him go from 5'9 to 5'10 or 5'11. Click Here ... Now, pay attention to his shoes specifically, and then look at his bandmates. Harry's shoe is by far larger than all of his bandmates. Why? Because he's wearing a shoe that's a larger size then what he should be wearing. He is obviously wearing lifts in those shoes as well. Still don't believe me? Ok, well here is him and his bandmates, see how he's Liam's height again? Click Here -- Now look at his shoes again, there bigger than all of his bandmates.. Very obvious they don't properly fit him, and they're a boot with a heel, which is the only reason he is taller, with his hair slicked up to give off an illusion that he is taller. Click Here - Notice the overly large clown looking shoe? Yup cause it's not his size. Here is Harry again with his bandmates. Liam is the tallest, notice the big downgrade? Click Here -- He's still wearing heeled boots, but he's not far from Louis who isn't even wearing lifts. Here is Harry again randomly taller then his bandmates. Click Here -- Shoe is bigger than everyone else (by far larger), and he is wearing lifts. Here is bare foot Harry with his bandmates... Notice the big downgrade? Click Here .. Louis is not wearing lifts, yet he is Louis's height. Here is a photo of Style with OVERLY LARGE converse (that is NOT his size.) With bandmate Click Here -- Keep in mind, he is barely taller than Louis and he is wearing shoes that isn't even his size, and the converse give him a bit of extra height because of how thick the bottom is. Here is a bare foot Harry, that is barely taller than a fan. Click Here -- Keep in mind, he is on a slope, but also, look at how he is leaning and on his toes, because he knows he isn't that tall. Here is Harry bare foot and being escorted by someone who isn't that tall. Click Here - Notice how Niall is almost Harry's height and Niall is probably the shortest? Around 5'7. If Harry was TRULY 5'9+ no way would Niall's lifts randomly make him AS tall as Harry. If Harry was 5'10/5'11 as well, Niall wouldn't even come CLOSE to 5'10/5'11 Harry. Seriously, look at how massive the shoes are that Harry wears. That obviously have a heel and lift in them. Now take a look at this photo with him and Taylor and look DIRECTLY at his shoes. Click Here - Look at how massive his SHOES are?? Sorry, but Harry isn't that tall. It seems he has a real strong insecurity when it comes to his height and I think he likes knowing that people think he's 5'11. It also doesn't help that Taylor's song painted him as this incredibly tall person when he isn't... So, I assume why he never takes off his heeled shoes/lifts. He is most likely in the 5'8-5'9 (mid) zone, nothing higher! @ Warren - At 17, Harry was wearing shoes bigger than his actual size, so no way he is taller than Liam. I'll dig through more photos. The guy is extremely insecure about his height and body, he even claimed to wear "custom made pants for big problems down there". Geeus, thankyou for proving Harry's nothing over 5'9"-175. He's identical to Crawford and Payne in height. Harry and Liam with Cindy Crawford.. Harry wearing his heeled shoes/size bigger. I really do not believe he is as tall as he says he is. In the last pic is super good looking, he's no under 5'9"
I don't see him over 5'9.25 !! 5'11 - 6' maybe in his dream! Joshua, Jake, because Harry Styles wears heels and its harder to judge his height correctly. WE also have Click Here zoom in, compare Harry in heels vs Tom Hardy in shoes and pay attention to posture, feet position, hairstyle. Tom Hardy claims to be 5ft9in and is listed that on this website and imdb. I don't think Harry is under 5ft9in tall, but he is definitely not the 6ft tall man he is listed by google and imdb. I think Harry is anywhere between 5ft9in and 5ft..(pauses,exhales heavily)5ft9.75in tall. Harry Styles is 6ft1in and he's very lean these days. The flat 5'9" would do him justice. But over 5'9.25 is impossible! Because David Beckham is actually 5'11"
Why so many people say that he is only 5’9, honestly I think he is a strong 6’0!! 5'11 - 6' without shoes ? Impossible!! He need downgrade to 5'9 ! and understand, this is how tall Harry wants to be. Born: February 1, 1994, Redditch, United Kingdom. Styles and Swift began dating in fall 2012, but they weren't officially photographed together until December 2012. By January 2013, they had called it quits. On the 1st of February 2013 Harry turned 19 years old. He is not a late bloomer. Are you telling me those shoes are the same thickness? I doubt he has lifts inside but some thick orthopedic insoles when he is out with his tall famous girlfriend. Google Taylor Swift and Taylor Lautner. Dated August 2009-December 2009. Taylor Swift(Born: December 13, 1989), Taylor Lautner(Born: February 11, 1992). Harry, 6ft tall my a**. I'm sure there'll be a concert near you or something. hey thats enough. he is max 5.9, look them photos from dunkirk gala. The tall dude is Chance.. The small dude is Nick.. He is 1.75m - 1.76m max!! 1.80m - 1.83 ? Never. oh, you can register free to view that 1 article. I was quoted many times, I'm not sure if this is a good, bad or neither? I'm begging for an answer guys. Editor Rob: well, I have no problem with people interested in or commenting on height. It's an interesting topic to some people and one that is very visual in nature. I got celebheights visitor's backs 🤝 So does Jenny! Niall Horan was forced to wear lifts in his high top sneakers for a brief period of time when he was in the 1D band. Then they started giving him high heeled boots like Harry and Zayn. After the band broke up, he started dressing up differently. Just look at his last appearance on Jimmy Fallon: thin soled low top converse looking sneakers, proper trousers with a white tucked in dress shirt, no blazer or jacket. Guy doesn't wear lifts/elevators, feels confident about his height and body in general but Niall is not average height. 5ft 7.75in (172.1 cm) fits Niall perfectly. Niall seems to be average height? srsly? Niall is the only honest member about their measurements. Niall would be taller than zain and Louis who are 5'7-5'7.5 wether as Niall could be a weak 5'8" I guess it's the top of the short range, but it might nudge Average who knows. i could stretch up to 5'9.75" on a good day. At my best day, maybe even a 5'10" flat though I won't be able to hold a flat 5'10" for the mid afternoon. I could hold the 5'9.75" mark from late afternoon to early evening. Most of the time, I do measure 5'9.5". @Slim what I'm saying is my height varies differently due to the odd genetics I share with my relatives. For Harry, I do agree with you that the old listing of 5'9.25" worked better. TBH Harry Liam and Niall seem to be average height, wether as zain and Louis are short. We need to see more pictures of Harry in talk shows or basketball games and see if his ankle is abnormally high, that's the best way to detect lifts. And Harry does look 176 tops in that photo. And if David is a weak 5'11, that would make harry 5'9" flat. And who knows if Harry wore a lift in that photo, he might be even shorter. Clearly a lift in that left shoe. CLEARLY. "they give him t-Rex forearms and abnormally long legs. "